YellowAirplane.com: Air and Space Museums in Michigan, Airplane Museums. Michigan Air and Space Museums. Aire Michigan y Museos del Espacio. Air and Space Museums in Michigan. Air and Space museums in Michigan. Michigan is nicknamed the Great Lakes State since it has shores on three of the great lakes. The population of Michigan is 9,329,000 people, number 8 of the 50 states, its capital is Lansing and its largest city is Detroit. The land area of Michigan is 56,809 square miles, number 22 of the 50 states, and its highest point is Mount Arvon which is 1,979 feet. Aire y del Espacio museos en Michigan. Michigan es el apodo de Estado de los Grandes Lagos, ya que tiene costas en tres de los grandes lagos. La poblacin de Michigan es 9.30 personas, el nmero 8 de los 50 estados, su capital es Lansing y de su principal ciudad es Detroit. La superficie de Michigan es 56.809 millas cuadradas, el nmero 22 de los 50 estados, y su punto ms alto es el Monte Arvon que es 1.979 pies. Michigan is the Home of "Willow Run", Henry Fords B-24 Liberator Factory. The B-24 Liberator was built in a factory called Willow Run in Detroit Michigan. The factory was built by Henry Ford and designed by Charles Sorensen. The Willow Run factory was named willow run because is it was built on the willow run creek. This is interesting because the last person to live on the Willow Run property was Warren Benjamin Kidder. I have spoken to Ben, personally, and he is one of the nicest people that anyone could ever meet. 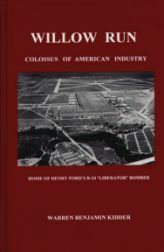 Ben wrote a book called Willow Run, Colossus of Industry, a book about the production of the B-24 liberator, military bomber. When the factory was in full production it produced a B-24 liberator every 56 minutes. This factory is one of Henry Ford 's greatest achievements. You can read more about this fantastic, very well written book by clicking here. Willow Run, The New Movie in Production. मिनेसोटा में विमानन संग्रहालयों. मिनेसोटा उत्तर सितारा राज्य nicknamed है. मिनेसोटा की जनसंख्या 4387029 लोगों को, 20 50 राज्यों की संख्या है, इसकी राजधानी सेंट पॉल और इसकी सबसे बड़ा शहर है Minneapolis है. मिनेसोटा के भूमि क्षेत्र 79,617 वर्ग मील है, संख्या 14 50 के राज्यों, और अपने उच्चतम बिंदु है ईगल माउंटेन जो 2301 फीट है.